What Is a Techxistential Crisis and How Do You Avoid One? Our love/hate relationship with social media continues. What is a techxistential crisis? As much as we can intellectually know that the expertly curated “highlight reels” displayed on social media feeds aren’t a real depiction of people’s lives, it can be hard to convince ourselves otherwise. In an article on Quartz on techxistential crises, writer David Schwartz explains that when we compare ourselves to these images and witty captions, it’s really not possible for most of us to feel anything but inadequate. “This leads to irritating inspiration, an impossible story, an awareness of our own lacking,” Schwartz writes. And in short, that is a techxistential crisis. At this point in our society, technology and social media aren’t going anywhere, so rather than focusing on all the ways it supposedly ruins people’s lives, it’s more productive to recognize the inherent duality of social media. On the one hand, social media has resulted in many positive outcomes for society, like increased access to information, opened lines of communication that may have otherwise been closed or inaccessible, more opportunities for community awareness, and options for global information sharing and checking, Mayra Mendez, Ph.D., a licensed psychotherapist and program coordinator for mental health services at Providence Saint John’s Child and Family Development Center in Santa Monica, California, tells Thrive Global. But all this accessibility comes with a downside, Mendez says — overuse. “The negative impact of social media over-usage may be seen interpersonally, emotionally, and physically,” she explains. For example, social media may prompt people to focus too much attention on their devices at the expense of productivity at work, home, or school. Spending too much time on social media may “delay completion of work and duties, interrupt sleep process, prompt obsessive thoughts and compulsive behaviors that interfere with effective and efficient problem-solving and self-sufficiency,” she adds. And when it comes to our connections to others, technology can be a uniter as well as a divider. “Social media is a two-edged sword as far as loneliness goes — we can feel closer to family, friends, and even make friends with similar interests. But if no one likes or shares or retweets our posts, we can feel unwanted and isolated,” Paul Levinson, Ph.D., professor of communication and media studies at Fordham University tells Thrive. For the generation of teens and young adults who have grown up with social media, overuse can interfere with the development of interpersonal skills and problem solving strategies that are practiced and mastered by face-to-face interactions, Mendez explains. 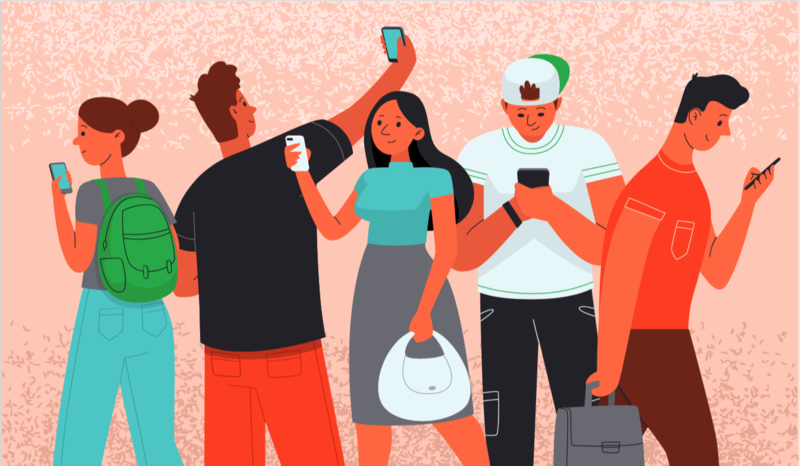 Over-reliance on technology can have lasting impacts for adults, too, prompting a false sense of connection that is static and fixed, rather than fluid and interpersonally rich, she adds. How you can avoid (or recover from) one? One of our Thrive Microsteps (too-small-to-fail, science-backed behavior changes you can implement right away) centers on limiting our screen time: taking a daily “tech time out” to improve your focus and reduce stress. Doing so will help you connect more with yourself and others. “Limiting social media time and committing to the limit allows for structure and balance,” Mendez explains. It can be really easy to sit at home in pajamas and communicate with people solely through your phone or laptop. But part of getting out of or avoiding a techxistential crisis is learning (or re-learning) how to interact with other humans in real-time, face-to-face, Mendez says. If this sounds daunting, remember that you can — and should — prioritize who you spend time with, focusing on people who bring out the best in you and bring you joy. The internet and social media are a bottomless pit of information, entertainment, and commentary: Be selective about what you read, watch, listen to, and share with others. Mendez suggests taking what you learned or thought was interesting on social media, and share it with other people in your life in person, using it as a form of social currency to connect with others. If someone disagrees with you, it’s far more productive to have debates offline than under a Facebook post or in a comments section.